Ukraine's parliament has passed a law defining areas seized by pro-Russian separatists in the east of the country as temporarily occupied by Russia. The law on the reintegration of the region was backed by 280 MPs, calling Russia an "aggressor" state. Moscow condemned the move, saying it could only be considered as preparation "for a new war". A month earlier Russia seized Ukraine's southern Crimea peninsula. 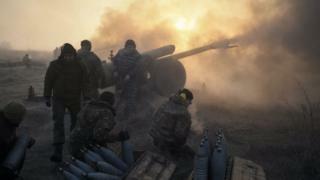 Ukraine's lawmakers passed the law on Thursday after heated discussions in parliament that lasted three days. "The Russian Federation is committing a crime of aggression against Ukraine and is temporarily occupying parts of its territory," the document says. The rise in tensions between Kiev and Moscow comes just weeks after Ukraine and the separatists exchanged hundreds of prisoners - in one of the biggest swaps since the conflict erupted. The new law is splashed across Ukrainian newspaper front pages on Friday - and many seem unimpressed. In a highly critical piece, the opposition tabloid Vesti expressed human rights concerns, asking "who will be regarded as the 'enemy of the people', whose homes may be searched and who will make a profit on the trade [with the rebel regions]?" News website Ukrayinska Pravda is also sceptical, saying: "Despite the plaudits, both the authorities and the opposition admit: the law does not solve the problem of de-occupation." "Contentious law adopted: How we will regain Donbass", reads a headline in the KP newspaper, which also looks in detail at the "controversial clauses that did not make it into the law". Russia's influential Kommersant newspaper says the new law effectively cancels the Minsk Accords and sees Kiev "turning its back on Paris and Berlin, the guarantors of the Minsk process, and putting the strategic stake on Washington." And Moskovsky Komsomolets says the Ukrainian authorities "have permitted the ATO [anti-terrorist operation] soldiers to do everything they did illegally before."